Vorwärts announcing a general strike in Germany on 9 November 1918, at the beginning of the November Revolution. A general strike (or mass strike) is a strike action in which a substantial proportion of the total labour force in a city, region, or country participates. General strikes are characterised by the participation of workers in a multitude of workplaces, and tend to involve entire communities. General strikes first occurred in the mid-19th century, and have characterised many historically important strikes. An early predecessor of the general strike may have been the secessio plebis in ancient Rome. In the Outline Of History, H.G. Wells recorded "the general strike of the plebeians; the plebeians seem to have invented the strike, which now makes its first appearance in history." Their first strike occurred because they "saw with indignation their friends, who had often served the state bravely in the legions, thrown into chains and reduced to slavery at the demand of patrician creditors." Wells noted that "[t]he patricians made a mean use of their political advantages to grow rich through the national conquests at the expense not only of the defeated enemy, but of the poorer plebeian..." The plebeians, who were expected to obey the laws, but were not allowed to know the laws (which patricians were able to recite from memory), were successful, winning the right to appeal any injustice to the general assembly. In 450 BC., in a concession resulting from the rebellion of the plebeians, the laws of Rome were written for all to peruse. The general strike action only became a feature of the political landscape with the onset of the Industrial Revolution. For the first time in history, large numbers of people were members of the industrial working class; they lived in cities and exchanged their labour for payment. By the 1830s, when the Chartist movement was at its peak, a true and widespread 'workers' consciousness' was beginning to awaken in England. William Benbow pictured in Punch in 1848. The first theorist to formulate and popularise the idea of a general strike for the purpose of political reform was the radical pamphleteer William Benbow. Closely involved with planning the attempted Blanketeers protest march by Lancashire weavers in March 1817, he became an associate of William Cobbett and passed his time "agitating the labouring classes at their trades meetings and club-houses." On 28 January 1832 Benbow published a pamphlet entitled Grand National Holiday and Congress of the Productive Classes. Benbow began to advocate direct and even violent action for political reform, in particular he advanced his idea for a "national holiday" and "national convention". By this he meant an extended period of general strike by the working classes, which would be a sacred or holy action (hence "holy-day"), during which time local committees would keep the peace and elect delegates to a national convention or congress, which would agree the future direction of the nation. The striking workers were to support themselves with savings and confiscated parish funds, and by demanding contributions from rich people. Benbow's idea of a Grand National Holiday was adopted by the Chartist Congress of 1839, Benbow having spent time in Manchester during 1838-9 promoting the cause and his pamphlet. In 1842 the demands for fairer wages and conditions across many different industries finally exploded into the first modern general strike (the 1842 General Strike). After the second Chartist Petition was presented to Parliament in April 1842 and rejected, the strike began in the coal mines of Staffordshire, England, and soon spread through Britain affecting factories, mills in Lancashire and coal mines from Dundee to South Wales and Cornwall. Instead of being a spontaneous uprising of the mutinous masses, the strike was politically motivated and was driven by a hard-headed agenda to win concessions. Probably as much as half of the then industrial workforce were on strike at its peak – over 500,000 men. The local leadership marshaled a growing working-class tradition to politically organise their followers to mount an articulate challenge to the capitalist, political establishment. Transforming itself suddenly from a problem of abandoned plantations and slaves captured while being used by the [Southern] enemy for military purposes, the movement became a general strike against the slave system on the part of all who could find opportunity. The trickling streams of fugitives swelled to a flood. Once begun, the general strike of black and white went madly and relentlessly on like some great saga. The next large scale general strike took place over half a century later in Belgium, in an effort to force the government to grant universal suffrage to the people. However, there were periodical strikes throughout the 19th century that could loosely be considered as 'general strikes'. In the United States, the Philadelphia General Strike of 1835 lasted for three weeks, after which the striking workers won their goal of a ten-hour workday and an increase in wages. Later general strikes include the 1877 Saint Louis general strike, which grew out of the events of the Great Railroad Strike of 1877 across the United States and the 1892 New Orleans general strike. The year of 1919 saw a cascade of general strikes around the world as a result of the political convulsions caused by the First World War – in Germany, Belfast, Seattle and Winnipeg. The Russian Revolution of 1905 saw a massive wave of social unrest across the Russian Empire, characterised by large scale general strikes on the part of the industrial workers. The 1926 United Kingdom general strike started in the coal industry and rapidly escalated; the unions called out 1,750,000 workers, mainly in the transport and steel sectors, although the strike was successfully suppressed by the government. At the turn of the 20th century, Belgium was particularly prone to large scale strike actions, with at least four mass strikes occurring in 1886, 1887, 1891, and 1893. In 1886, there was the Walloon Jacquerie of 1886, but without an actual leading political organisation. The final strike was the Belgian general strike of 1893 mentioned above. In 1902 the Belgian Labour Party launched another strike, which failed. Many German social democrats thought such an experiment was absurd. Drachkovitch observed that German socialists were against the general strike because "under the Kaiser, supporting it was not very safe." Rosa Luxemburg, in her 1906 book The Mass Strike, the Political Party and the Trade Unions had a different view, criticizing the Belgian Labour Party for perceived tactical incompetence: A general strike forged in advance within the fetters of legality is like a war demonstration with cannons dumped into a river within the very sight of the enemy. In German Social Democratic circles, the general strike suffered from the hereditary taint of its anarchist origins (...) Rosa Luxemburg, who studied the Belgian strike, was particularly impressed with its success in activating the political consciousness of the backward portions of the population. She was not yet however, prepared to give it European-wide significance. Luxemburg felt it to be appropriate only in countries in which industry was geographically concentrated. General strikes have been done in order to seek "democracy, political representation and the provision of basic education and healthcare". In Europe, general strikes were very common in the 19th and early 20th centuries. In Portugal, a general strike has been called by the federation of public labour unions to avert austerity measures. In Honduras, a general strike was called in 2011 by Union workers, farmers and other organisations demanding better education, an increase in the minimum wage and against fuel price hikes. In Yemen, thousands of people took the streets in a general strike in 2011 to protest President Ali Abdullah Saleh. In Algeria, public sector workers have mounted a general strike for higher wages and improved working conditions. In February, 1947, General Douglas MacArthur, as Supreme Commander of the Allied Powers in Japan, banned a planned general strike of 2,400,000 government workers, stating that "so deadly a social weapon" as the general strike should not be used in the impoverished and emaciated condition of Japan so soon after World War II. Japan's labour leaders complied with his ban. A General Strike in a community. A General Strike in an Industry. A revolutionary or class strike—the General Strike. [The name "General Strike"] is often used to designate the strike of all branches in one trade; for instance the general strike of the miners; when helpers and hoisting engineers, etc. are all out. Then it is used as: General Strike of a city, i.e., "General Strike in Florence", or a General Strike in a whole country or province, for the purpose of gaining political rights, i.e., the right to vote; as in Belgium, or Sweden. Strike (1910) by Stanisław Lentz, National Museum in Warsaw. Naft's 1905 pamphlet (translated from the German language) traced existing sentiment for this goal of the general strike to proletarians of Spain and Italy. ...do the same thing as the ruling classes have done uninterruptedly for thousands of years: that is, "consume without producing." This deportment of the ruling classes the working class calls exploitation, and if the proletarians do it, the possessing classes call it plundering—and socialism calls it expropriation. In 1966, in a study of revolutionary socialism, Milorad M. Drachkovitch of the Hoover Institution on War, Revolution, and Peace (a conservative/libertarian think tank), noted two tactical options which divided late 19th century and early 20th century anarchists from socialists: electoral politics, which the socialists embraced, but anarchists generally opposed; and, the general strike as a mechanism to prevent war, which anarchists supported, but socialists refused to endorse. As a group, the Socialists of the period repeatedly rejected the general strike as a tactic; however, a number of Socialist leaders advocated its use for one reason or another. Socialist leaders who embraced the general strike tended to see it as an instrument for obtaining political concessions. a one-day demonstration general strike on May Day (International Workers' Day), aimed at identifying a "worldwide proletariat"
Drachkovitch perceived the first two concepts, the socialist-friendly general strike for political rights within the system, and the general strike as a revolutionary mechanism to overthrow the existing order—which he associated with a "rising anarcho-syndicalist movement"—as in conflict. Drachkovitch believed that the difficulty arose from the fact that the general strike was "one instrument", but was frequently considered "without distinction of underlying motives." In Belgium a general strike movement, broken off in one instance without damage to the organizing forces, eventually led to universal suffrage; in Holland a general strike collapsed with disastrous consequences; in Sweden, a general strike was conducted and terminated with disciplined order but did not attain the desired results. In Italy, general strikes had been both socially effective and politically unproductive. On the other hand, the events of January 1905 in Russia once more seemed to underscore the suitability of the general strike as a decisively revolutionary action. Orthodox labour unions typically act as a representative from the workers to employers. They bargain over wages, hours, and working conditions. Other labour organisations typically bargain for the same wage, hour, and conditions improvements, but embrace a critique of capital as establishing and maintaining a permanent working class and an elite ruling class. These unions therefore advocate a permanent solution to the circumstances of strikes, injunctions, and crossing other workers' picket lines. Given the hierarchical relationships of the existing economic system, these other unions perceive the necessity of a radical change in the social order. In brief, these unions are radical in their orientation, and may accurately be described as revolutionary. One labour movement philosophy of "peaceful revolution" is known as syndicalism. Its tactical method is the strike—the regular strike for protecting the material welfare of the workers, and the general strike as a means to accomplish the desired permanent solution to industrial strife. Syndicalism has been a common union organizing principle in a number of European countries, including France, Spain, and Italy. One variation of syndicalism is anarcho-syndicalism, which (in comparison to syndicalism) develops rank and file power with democratic traditions to maintain worker control over union leadership. ...the I.W.W. concept of the General Strike differs almost as much from that of the anarcho-syndicalist as from that of the political or craft unionist. In form, structure and objective, the I.W.W. is more all-sufficient, more mature and more modern than any of its anarcho-syndicalist predecessors. The capitalists have wealth; they have money. They invest the money in machinery, in the resources of the earth. They operate a factory, a mine, a railroad, a mill. They will keep that factory running just as long as there are profits coming in. When anything happens to disturb the profits, what do the capitalists do? They go on strike, don't they? They withdraw their finances from that particular mill. They close it down because there are no profits to be made there. They don't care what becomes of the working class. But the working class, on the other hand, has always been taught to take care of the capitalist's interest in the property. Bill Haywood believed that industrial unionism made possible the general strike, and the general strike made possible industrial democracy. According to Wobbly theory, the conventional strike is an important (but not the only) weapon for improving wages, hours, and working conditions for working people. These strikes are also good training to help workers educate themselves about the class struggle, and about what it will take to execute an eventual general strike for the purpose of achieving industrial democracy. During the final general strike, workers would not walk out of their shops, factories, mines, and mills, but would rather occupy their workplaces and take them over. Prior to taking action to initiate industrial democracy, workers would need to educate themselves with technical and managerial knowledge in order to operate industry. According to labour historian Philip S. Foner, the Wobbly conception of industrial democracy is intentionally not presented in detail by IWW theorists; in that sense, the details are left to the "future development of society". However, certain concepts are implicit. Industrial democracy will be "a new society [built] within the shell of the old." Members of the industrial union educate themselves to operate industry according to democratic principles, and without the current hierarchical ownership/management structure. Issues such as production and distribution would be managed by the workers themselves. In 1927 the IWW called for a three-day nationwide walkout—in essence, a demonstration general strike—to protest the execution of anarchists Ferdinando Nicola Sacco and Bartolomeo Vanzetti. The most notable response to the call was in the Walsenburg coal district of Colorado, where 1,132 miners stayed off the job, and only 35 went to work, a participation rate which led directly to the Colorado coal strike of 1927. At SCFL’s monthly meeting Monday, Feb. 21, delegates endorsed the following: "The SCFL endorses a general strike, possibly for the day Walker signs his 'budget repair bill.'" An ad hoc committee was formed to explore the details. SCFL did not CALL for a general strike because it does not have that authority. The year 1919 saw a number of general strikes throughout North America, including two that were considered significant—the Seattle General Strike, and the Winnipeg General Strike. 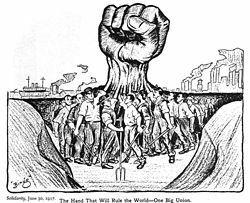 While the IWW participated in the Seattle General Strike, that action was called by the Seattle Central Labor Union, affiliated with the American Federation of Labor (AFL, predecessor of the AFL-CIO). In June, 1919, the AFL national organisation, in session in Atlantic City, New Jersey, passed resolutions in opposition to the general strike. The official report of these proceedings described the convention as the "largest and in all probability the most important Convention ever held" by the organisation, in part for having engineered the "overwhelming defeat of the so-called Radical element" via crushing a "One Big Union proposition", and also for defeating a proposal for a nationwide general strike, both "by a vote of more than 20 to 1." The AFL amended its constitution to disallow any central labour union (i.e., regional labour councils) from "taking a strike vote without prior authorization of the national officers of the union concerned". The change was intended to "check the spread of general strike sentiment and prevent recurrences of what happened at Seattle and is now going on at Winnipeg." The penalty for any unauthorised strike vote was revocation of that body's charter. 1862-1865: The plantation general strike in the Confederate States of the U.S.
1892: New Orleans General Strike, New Orleans, Louisiana, U.S.
1905: The Great October Strike, Russia; see 1905 Russian Revolution. World's largest general strike. 1919: Seattle General Strike, Seattle, Washington, U.S.
1920: General strike in Germany to stop Kapp Putsch. 1974: Ulster Workers Council Strike, Northern Ireland. 1978–1979: Strikes during Iranian Revolution. ^ a b Bamford, Samuel (1843). Passages in the Life of a Radical. ^ "Institution of the Working Classes". UCL Bloomsbury Project. University College London. Retrieved 28 August 2012. ^ Linton, W. J. James Watson. Manchester: Abel Heywood & Sons. ^ Beer, M (1921). A History of British Socialism. London: G. Bell & Son. ^ F.C.Mather (1974). "The General Strike of 1842: A Study in Leadership, Organisation and the Threat of Revolution during the Plug Plot Disturbance". web.bham.ac.uk/1848. George Allen & Unwin Ltd London. Retrieved 30 January 2008. ^ W.E.B. Du Bois, Black Reconstruction in America, 1935 (New York: The Free Press, 1998), 63-4. ^ "What do we mean by a General Strike?". ^ Carl Strikwerda (1997). A house divided: Catholics, Socialists, and Flemish nationalists in nineteenth-century Belgium. Rowman & Littlefield. p. 109. ISBN 978-0-8476-8527-1. Retrieved 23 September 2010. ^ Paul Frölich (August 1994). Rosa Luxemburg, ideas in action. Pluto Press. p. 141. ISBN 978-0-902818-19-4. Retrieved 23 September 2010. ^ Carl E. Schorske (1983). German social democracy, 1905-1917: the development of the great schism. Harvard University Press. p. 34. ISBN 978-0-674-35125-7. Retrieved 23 September 2010. ^ Labour research - Labour Research Department, Fabian Research Department - Google Books. Books.google.com. Retrieved 15 August 2012. ^ Milorad M. Drachkovitch, The revolutionary internationals, 1864–1943, Hoover Institution on War, Revolution, and Peace, Stanford University Press, 1966, page 99. His actual term was "mutually exclusive." ^ Thomas J. Hagerty and W. E. Trautmann, One Big Union, An Outline of a Possible Industrial Organization of the Working Class, with Chart, 1st edition, Charles H. Kerr & Company, 1911. ^ a b Bill Haywood, The General Strike (Chicago, n.d.), pamphlet, published by Industrial Workers of the World, from a New York City speech delivered March 16, 1911. ^ a b The Beginning of an Era, from Situationist International No 12 (September 1969). Translated by Ken Knabb. Henry L. Slobodin, "The General Strike," International Socialist Review, vol. 17, no. 6 (December 1916), pp. 353–355. The Mass Strike by Rosa Luxemburg (1906). General Strike 1842 From chartists.net, downloaded 5 June 2006. Strike! Famous Worker Uprisings—slideshow by Life magazine. This page was last edited on 21 March 2019, at 13:05 (UTC).